SAN FRANCISCO, CA--(Marketwired - Apr 15, 2014) - Weather Underground, the world's first online weather service, has launched a new logo and a full visual brand redesign across its website and numerous mobile applications. Weather Underground's mission today is the same as it was back in 1995: to unlock and share vast amounts of weather data with as many people as possible using the latest digital technologies. As consumer demand for weather data has been transitioning from desktop to mobile, so has the company's need to address the challenge of creating user interface designs that can present increasing levels of data on decreasing screen sizes. "All elements of the new brand, from the contemporary logo to the responsive design of wunderground.com, have been optimized for the multi-device world that we now live in," explains Jim Menard, General Manager of Weather Underground. "Our focus remains fixed on providing users with as much data as possible, as quickly as possible, and the new brand provides a blueprint that allows all of our products to highlight the unique data that our community generates." The new look of the website (wunderground.com) features a new 'dashboard' for each of the 34,000+ personal weather stations that are owned by members of Weather Underground's unique global community. All of the community sections of the site have been enhanced to reinforce the value generated by Weather Underground's loyal and engaged user base. "The Weather Underground community is the cornerstone of our brand and the design of our new products makes it easier than ever for people to contribute content through crowd reporting, photos, weather station data or simply benefit from the information so generously shared by others," says Toby Skinner, VP at Weather Underground. "As pioneers of the Internet, we're confident that our new visual brand ensures a consistent user experience across all platforms and is primed not only for today's digital landscape, but also for tomorrow's new technologies," added Skinner. For additional information about the new Weather Underground brand, please visit the Redesign page. 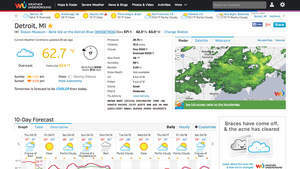 Founded in 1995 as the first online weather service, Weather Underground supplies weather data solutions to the many of the leading media companies and millions of users across the globe through their mobile apps and website wunderground.com. With over 34,000 personal weather stations worldwide, Weather Underground is able to provide meaningful and reliable weather data to people in real-time. Weather Underground is part of The Weather Company and is based in San Francisco, California.